The Battle of Gettysburg was fought in Gettysburg, Pennsylvania on July 1-3,1863 and considered by many to be the most important battle as well as the critical Union victory of the American Civil War. It is the turning point of the war for the North, as well as the Confederate High Tide, being the northernmost large scale battle of the war where for a few brief moments only, the Rebels penetrate the Union line on July 3rd at “Picketts’ Charge”. CSA General Robert E. Lee would never invade the North again. >The Confederate Army has brought the war to northern soil with the Battle of Antietam in September 1862, as well as several key CSA victories farther south such as Fredericksburg in December 1862 and Chancellorsville in May 1863. > Northern war sentiment is low and political support for President Lincoln is weakening as the Liberals and Democrats extol the defeats of the Union Army placing the blame of the war and its terrible losses squarely on Lincoln’s shoulders. > Liberal Northern newspapers and their editors such as Horace Greeley and the New York Tribune have a strong impact on their readers and can change public opinion of the war or opinion of President Lincoln himself overnight. This in fact was Lee’s strategy to not only destroy the Union Army of the Potomac on northern soil, but also to demoralize the North before the Presidential election. The possibility of Union capitulation and Confederate victory would rest on Lincoln’s removal and the recognition of the Confederacy by powerful European nations, especially England who has been considering recognition of the Confederate States of America. Had the CSA received that recognition after a victory at Gettysburg followed by Euro military support, the outcome of the Civil War and our young nations post Civil War history..as a Union..might have been quite different ! Watch the Battle of Gettysburg on DVD. A superb reenactment that includes great performances from a cast of the finest actors who understood the importance of their roles. A great addition to your Civil War Library for family and friends to enjoy. Defense: The Army of the Potomac is in fact south of Lee and his newly reorganized Army of Northern Virginia as it heads north through Maryland into Pennsylvania. The basic strategy of the Union army keeping itself positioned between Lee and Washington DC. has given Lee time to move all 3 of his battle hardened corps into position, choosing the best land for the battle that will give him the final victory required to win the war for the South. 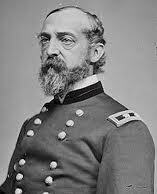 Union Commander: Major General George Gordon Meade has been given command of the Army of the Potomac just June 28th. With a direct order from Lincoln to accept that command, he is trying to catch up so to speak and find “Bobby” Lee as he knows he has been moving north with all 3 corps of the Army of Northern Virginia since early June. Lee’s moves are no secret as they are even published in newspapers, and every Union officer understands that this battle will be the tipping point in this war to ” retain a union, and set men free“. The key as in most military actions will be who gets the most men to the field first, seize the initiative taking the high ground, force the enemy to the offensive, defeat arriving enemy units in “in detail” as they are forced to attack well entrenched defenses. 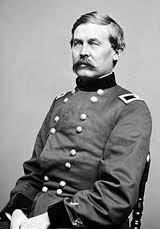 * Major General John Buford was in fact the commander of the Union cavalry that makes initial contact with CSA General Pettigrew’s brigade under General Heth, as it goes a few extra miles down Cashtown Pike to find the “shoe factory” in Gettysburg. Buford can see the grayclad Confederate army a mile away on the evening of June 30th as it comes toward Gettysburg, stops and than strangely “recoils” back up the Cashtown Road. Outnumbered 3 to 1 as Buford has approx. 2,700 troopers ( dismounted cavalry with every 3 men on the firing line as the 4th man holds 4 horses) against the initial impact of 2 Confederate brigades of approx. 7,600 men. Buford knows he can stand and fight, but can he hold them long enough to keep the high ground until he is reinforced by more Union troopers ! He knows the whole Reb army is coming his way, while the first Union reinforcements are hours away. Maybe too far away. Buford knew 2 things at that time. 1) That the Rebels did not have cavalry out in front which was odd for an army that size 2) that the Confederates had received orders not to engage and so had fallen back. But they would attack soon. What did Bobby Lee have in mind and where was he. Buford will send scouts up all the roads as vedettes. He will be alerted at 0730 hrs the next morning July 1, 1863 as he hears his vedettes being driven in, firing their 1-2 shots before fleeing the advancing columns of Confederates. Buford will succeed in his “stop gap” measure and hold the high ground after several withdrawals and the first Confederate brigades long enough to be reinforced by the 1st Corp under Major General John Reynolds. Sadly,this dedicated officer will also be counted among the dead just 6 months later on Dec. 16, 1863 from typhoid and fever. Surrounded by friends, especially the dashing Myles Keogh ( Johns’ aide ) who held his commander as he lay dying. John would be given a promotion just hours before his death..to General. Myles Keogh himself would join his deceased ‘brothers in arms’ 13 years later..on June 26, 1876.. along with his new commander George A. Custer ( and family ) at The Battle of the Little Bighorn. * Major General John F. Reynolds and his Union I Corp did in fact message to Buford that he would get to Gettysburg as quickly as possible in the morning of July 1 to reinforce. John Buford will dig his boys in and wait patiently for the attack at dawn they were sure to receive. It will be a long morning and hours of uncertainty for Buford as he hears the carbine fire from his 2 brigades lessening. The defensive firing lines of his cavalrymen are being attacked and reduced. Watching from the cupola of the Seminary for any sign of reinforcements, he finally sees General John Reynolds riding in with his aides under the fluttering guidon of I Corp just in time. Major General John F. Reynolds will be killed this same morning by a Confederate sniper. 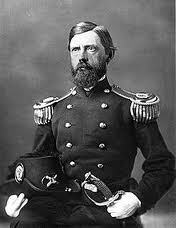 He is the first general to die at the Battle of Gettysburg. A tremendous loss to the Union, it was quoted by the fine Civil War author Shelby Foote that Reynolds was considered by many to be “The best General in the Union army”. His advice to Buford and arrival with I Corp will give the rest of the Union Army time to arrive and assemble their defenses as they are being pushed back through the town itself. Finally able to make a stand on the high ground of Culp’s Hill and Cemetery Hill, the Union Army has a good military position to make their stand against the assembling Rebel Army. The Union line will keep extending itself south over the next 24 hours down Cemetery Ridge for 2 miles with the Confederates lines just west on Seminary Ridge. 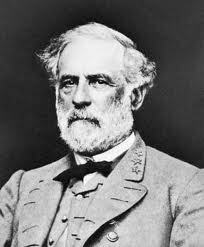 Attack: CSA Commander Robert E. Lee had a plan that if fulfilled would in fact had great chances of destroying the Union Army of the Potomac. But circumstances will change the events of the next 24 hours that will force Lee to amend his strategy and tactics and not for the better. Lee himself is not well and suffering from exhaustion and a weakness that has been ailing him for several months. Still convinced that the Army of Northern Virginia could defeat the Union Army as in recent battles, Lee is sure he can destroy the Union Army of the Potomac completely. But his orders and communications to his commanders has become vague and without specifics. This lack of exactness from Lee as well as the late arrival of his cavalry commander CSA General J.E.B. Stuart leaves the Confederate Army without prompt and accurate intelligence as to the positions of the Union Army, and how to adapt the CSA attacks, in response to the Union Corps as they arrive and their deployments. 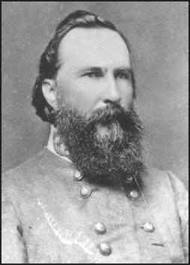 CSA General James Longstreet, Lee’s “Old Warhorse”, called Pete by his close friends is against attacks and Lee has generally agreed they will join the corps up together to take the defensive. This changes as the Union takes the defensive and forces the arriving CSA corps to attack as they arrive. Longtreet would argue after the war that he was generally against Lee’s plan to fight a battle north, far from the CSA base of operations, especially attacking the enemy on their own ground. 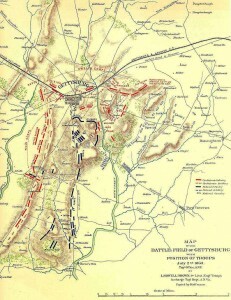 After 2 days of Confederate attacks with limited success, the first on the Union left on July 1st and than both the Union flanks by the combined CSA corps under Longstreet, Hill and Ewell, Longstreet will not agree with Lee when he orders a full frontal attack on the Union center on July 3rd. The doomed charge of 12,000 Confederates across the mile wide expanse into the Union guns goes down in history as one of the most courageous but deadly charges of the American Civil War that came to be named and remembered as “Pickett’s Charge”. Considered to be the High Water Mark of the Confederate effort during 4 long years of war. 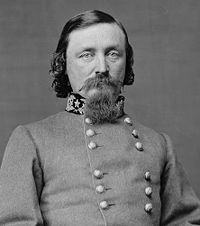 General George Edward Pickett, Division Commander under Longstreet has arived with his division the evening of July 2nd. Lee’s plan to attack the Union center on July 3rd is given to Longstreet who appoints Pickett to command the attack and lead with his “fresh” troops from Virginia. Pickett himself will command from the rear and watch as his Virginians are decimated by Federal cannon ball followed by cannon cannister, and finally by massed Union musket fire. The brave Confederates fall back to Seminary Ridge where Lee states “this is all my responsibility”, but the men want to attack the Union center again. Only CSA General Lew Armistead , a good friend of Union General Winfield Hancock will actually make it through the Federal lines with a few of his brave Virginians. But they are not enough and will not be reinforced, as General Armistead himself will fall near the Union guns from mortal wounds near the area later known as “The Angle”. This moment will after the war be understood to be the “High Water Mark of the Confederacy”. Important Note: Often overlooked is the Union Cavalry strategy and defensve actions by the troopers under Union General George Armstrong Custer on the third day of battle. Just 3 miles away from town, Custer and his men would locate and engage the Confederate Cavalry under General J.E.B. Stuart, who were to attack the Union rear from the east as Lee was attacking the Union center during the well remembered “Picketts’ Charge”. Custers’ men would attack Stuarts column and successfully splinter the proposed Rebel “pincer” movement against the Union center. General Custer’s overconfidence and meteoric climb in the military would bring him 13 years later to his destiny we all remember. On a small hill near the Little Bighorn River in the Black Hills of Montana, 4 Custer family men would lose their lives in the engagement known as Custers’ Last Stand. Battle outcome: Decisive Union victory. Make a plan to visit Gettysburg, enjoy a nice weekend seeing the sites and walking the battlefield. Learn before you go. Here is a selection of informative books filled with the emotional stories of the epic battle. Note the “The Complete Gettysburg Guide” that “tours” you through the fields and town explaining the the battle as it unfolded. Many thanks for your interest. I do not remember his name though. Will have to enjoy the documentary again and get his name next time.